For Texas’ baseball team, the objective remains the same. Two wins, and it’s off to Omaha. The margin of error, however, just got a lot smaller. Unable to overcome a three-run fifth inning and Tennessee Tech’s top reliever, Texas fell 5-4 in the opener of its super regional Saturday. The one-run loss at UFCU Disch-Falk Field pushes Texas to the brink of elimination. UT (40-21) must beat Tennessee Tech (53-10) on Sunday and Monday to reach the College World Series. In front of an announced crowd of 7,062, Texas landed the first punches in this super regional rumble. Texas scored on two sacrifice flies during the game’s first three innings. A third-inning homer from Kody Clemens gave UT a 3-2 lead. Then Tennessee Tech’s offense — which had been rated as one of the nation’s best — lived up to its billing. The Golden Eagles opened the fifth inning with a walk and a single, and the runners advanced a base when Nolan Kingham struck out Kevin Strohschein on a wild pitch. Cleanup hitter Chase Chambers then crushed an offering that Texas center fielder Tate Shaw mistimed. Shaw crashed into the wall without the baseball, and two runs scored. Chambers later scored on a two-out double to give Tennessee Tech a 5-3 lead and the deciding run. Ahead of Saturday’s showdown, Tennessee Tech led the NCAA in batting average (.338), on-base percentage (.434), slugging percentage (.589), home runs (134) and runs (630). Texas kept the Golden Eagles from scoring again behind a solid effort from relievers Kamron Fields, Josh Sawyer and Parker Joe Robinson. They didn’t need any additional offense, though. Tennessee Tech coach Matt Bragga loosely referred to Ethan Roberts as his closer Friday, saying he’d call on him in a “competitive moment.” Against the Longhorns, that moment came after starter Marcus Evey issued two four-pitch walks to lead off the sixth inning. Four days after the Chicago Cubs used a fourth-round pick on Roberts, the right-hander struck out the first three batters he faced. Roberts allowed only a walk and a seventh-inning double to McKenzie, who scored on a sacrifice fly. Roberts struck out four Longhorns over a four-inning outing that needed 56 pitches. Bragga said Roberts would probably be unavailable Sunday. Tennessee Tech held Texas to five hits, three of which were collected by McKenzie out of the ninth slot in the batting order. Around the bases: Texas will start Chase Shugart (5-3, 4.36 ERA) against Travis Moths (13-2, 3.86) on Sunday. … Tennessee Tech outfielder Alex Junior was hit in the jaw with an eighth-inning pitch, but he remained in the game and attended the postgame press conference. Golden Eagle second baseman John Ham left Saturday’s game after he blacked out, but Bragga said he thinks “he’ll be OK.” … After giving up nine hits in 4 2/3 innings, Kingham took his fourth loss of the season. Pierce said Kingham had a cyst removed earlier in the week. 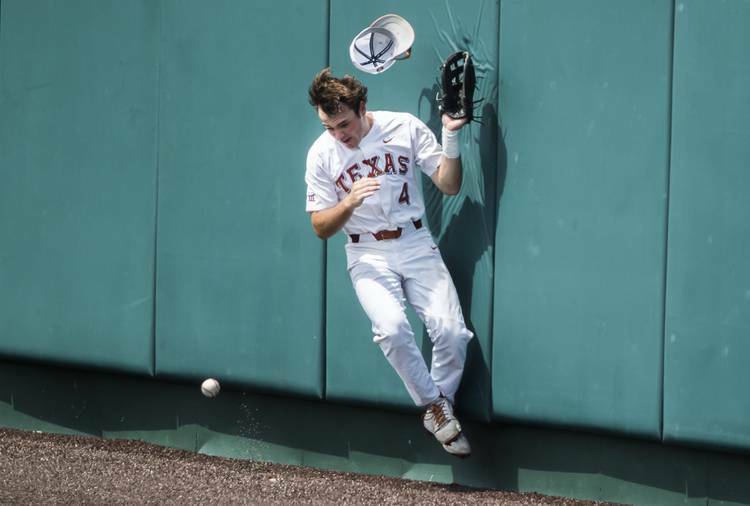 … Texas sophomore Ryan Reynolds was hit by a pitch for the 18th time this season.